In our backyards, on our porches, and outside our synagogues, Jews mark the fall harvest by building sturdy—yet fragile—structures out of natural materials, symbolizing both human vulnerability and God’s protection. No harvest holiday is complete without its fertility symbols, and Sukkot—when we wave the lulav and etrog —is no exception. Welcome Jewish women from throughout the ages into your sukkah as ushpizot, honored guests. Enjoy the crisp autumn air as you decorate your sukkah, then spend time with friends and family, celebrating your blessings and committing to sharing your bounty with others. Sukkot , also known as the Feast of Tabernacles, is the third and final harvest festival of the Jewish calendar. Its festivities contain both celebration of the ingathering of the earth’s abundance and prayers for rain so that the new harvest will grow. This holiday has existed since the time of the Bible and is still celebrated with the waving of bundles of plants—palm, myrtle, willow, and citron—and with seven days of dwelling in outdoor harvest booths. These booths or sukkot, made with walls but open to the sky, with a roof of branches that let in the light of sun and stars, represent the fragility of our existence and our dependence on the earth’s gifts. Dwelling for a week in a sukkah is a way to get in touch with our relationship to the elements: soil, wind, trees, sun, rain. Five days after the end of Yom Kippur, the festival of Sukkot begins. Sukkot is a weeklong holiday dedicated to bringing worship outside, literally, and it can be understood as our opportunity to face the world anew after the powerful experience of introspection and t’shuva (commitment to change) of the preceding days. One of the three pilgrimage festivals (sh’losh regalim), Sukkot is both a harvest festival and connects us to the time when recently freed Israelites built fragile lives and homes in the wilderness. A time for appreciating our blessings, Sukkot reminds us to pause and acknowledge the abundance of our tangible and symbolic harvests. 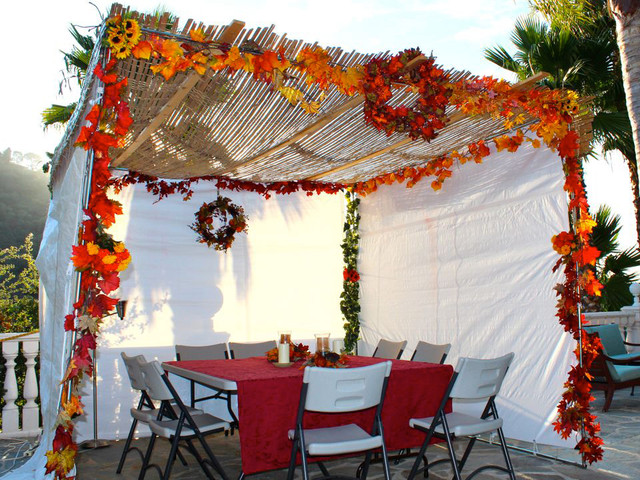 Sukkot, a Hebrew word meaning “booths” or “huts,” refers to the Jewish festival of giving thanks for the fall harvest. It also commemorates the 40 years of Jewish wandering in the desert after the giving of the Torah atop Mt. Sinai. Sukkot is celebrated five days after Yom Kippur on the 15th of the month of Tishrei, and is marked by several distinct traditions. One, which takes the commandment to dwell in booths literally, is to erect a sukkah, a small, temporary booth or hut. Sukkot (in this case, the plural of sukkah) are commonly used during the seven-day festival for eating, entertaining and even for sleeping. Sukkot concludes with the celebration of Simchat Torah, when Jews mark the cycle of Torah readings by finishing the book of Deuteronomy and immediately beginning the book of Genesis. This practice reminds us of the constant need to study all that Torah has to offer, including teachings regarding social justice and righteousness.